The dramatic story of one of the greatest disasters in historyIn 1917, the port of Halifax, Nova Scotia, was crowded with ships leaving for war-torn Europe. On December 6th, two of them—the Mont Blanc and the Imo—collided in the Narrows, a hard-to-navigate stretch of the harbor. Ablaze, and with explosions on her deck filling the sky, the Mont Blanc grounded against the city’s docks.As thousands rushed to their windows and into the streets to watch, she exploded with such force that the 3,121 tons of her iron hull vaporized in a cloud that shot up more than 2,000 feet; the explosion was so unusual that Robert Oppenheimer would study its effects to predict the devastation of an atomic bomb. The blast caused a giant wave that swept over parts of the city, followed by a slick, black rain that fell for ten minutes. Much of the city was flattened, and not one in 12,000 buildings within a 16-mile radius left undamaged. 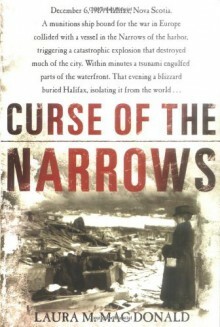 More than 1,600 Haligonians were killed and 6,000 injured; and within twenty-four hours, a blizzard had isolated Halifax from the world.Set vividly against the background of World War I, Curse of the Narrows is the first major account of the world’s largest pre-atomic explosion, the epic relief mission from Boston, and the riveting trial of the Mont Blanc’s captain and pilot. Laura M. Mac Donald is as adept at describing the dynamics of a chain reaction explosion as she is at chronicling unforgettable human dramas of miraculous survival, unfathomable loss, and the medical breakthroughs in pediatrics and eye surgery that followed the disaster.Using primary sources--many of which haven’t been read in decades and--with a wonderful feel for narrative history, Mac Donald chronicles one of the most compelling and dramatic events of the 20th century.